Uncover more in our brilliant blog. The attractive and characterful fishing port of Craster is most famous for its kippers (cured herring fish) and as starting point for a lovely walk along the headland to Dunstanburgh Castle. Craster has plenty of Northumbrian character, it’s also a good place for the food lover to visit, with a good ‘foodie’ pub, the Jolly Fisherman, an artisan-style cafe and famous Smokery. The renowned artist Mick Oxley has an art gallery and shop in Craster too. 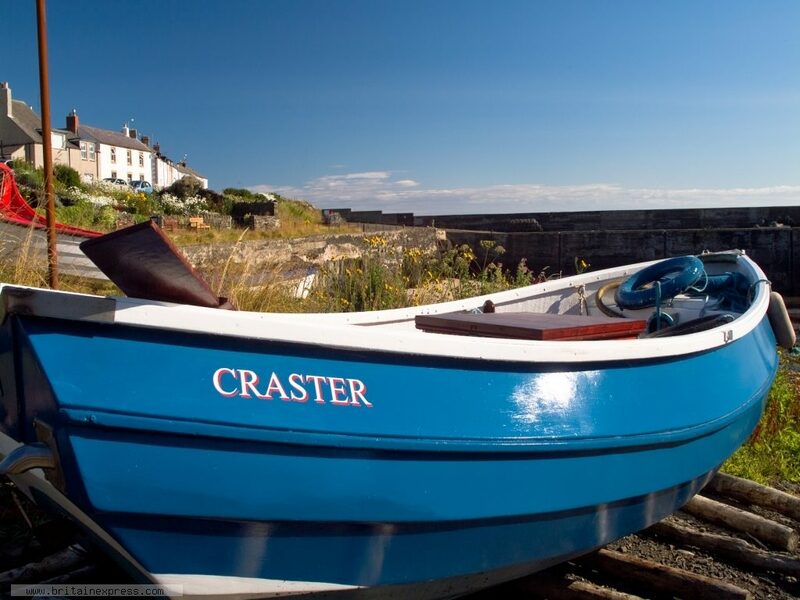 Craster has something for everyone, it is often used as a base for coastal walks and for fishing. Part of Robson’s Smokehouse, the Craster Fish Restaurant has lovely views over the harbour from the dining room. It has somewhat of a reputation for the service (or lack of – see trip advisor reviews here), but has been highly recommended for its food. Also located next to the Tourist Information Centre you will usually find Pipers Pitch. You can try their famous hot buttered Craster Kipper or home made scones and soups. All their food is cooked fresh and made to order. The Cottage Inn is the second pub in the area, just outside Craster village, set in 6 acres of woodland on the edge of the village of Dunstan. The Cottage Inn is also a three star rated B&B with ten bedrooms and has a restaurant that serves lunches and evening meals, along with a fine selection of real ales. The Inn has been recently refurbished and has a conservatory that leads from the restaurant out to the patio area of a secluded garden. Click here for the website. Situated in the centre of Craster, opposite the Mick Oxley Gallery is the Shoreline Cafe. It’s open daily from 10am – 4pm year round and has a few tables at the front where you can bring your dog as well. It offers lovely home baking, cakes, fresh coffee and sandwiches. If it’s a drink you’re after with your meal there are two pubs in Craster. The first is the The Jolly Fisherman on the south side of the harbour, offering lovely views and a good range of food including a fine Sunday Lunch. The majority of dishes on the menu here – as you would expect to find in a fishing village – are fish and seafood. Haven Hill, with the Jolly Fisherman and the smokehouse recently had the honour of being nominated for a Google Street View award for ‘Best Foodie Street’. Click here for The Jolly Fisherman website. This family-run coffee shop is a gorgeous place to stop for a sweet treat or light bite. Using all local suppliers such as Doddington Dairy, Pumphrey’s Tea & Coffee and L. Robson & Sons famous Craster Kippers, The Stable Yard is also a plant nursery selling a selection of bedding and herbaceous plants, roses compost and pots. The ‘Restaurant without Walls’ is located at the Craster Quarry Car Park, serving local hearty food from their trusted van. Craster Kippers in a bun, even omeletes and fresh scones are served here with fresh coffee and hot tea. Andy and Lorna are there every day of the week and weather-dependent, they are seasonal. There is a Tourist Information Office adjacent to Craster’s main car park, where there are also public toilets, a shop and cafe. Craster has just one Church now (The Methodist Chapel closed in 2013), Anglican services are held at St Peter the Fisherman which is on Chapel Row. There is an RNLI Station in the harbour manned by volunteers from the local area and has for over 35 years manned a D Class lifeboat. There is a large children’s play area towards the South end of the village (turn right at the harbour and walk along the main road), it’s a good spot right on the sea front for the kids to burn off some energy or have a picnic. There is a small village shop in Craster on Church Street, within the Shoreline Cafe. Otherwise Alnwick is the next nearest town. Here you will find a Sainsbury’s, Morrisons, Iceland, Lidl, ALDI and Co-op along with numerous independent deli’s, butchers, bakers and other shops selling excellent quality local produce. The gallery is a lovely open space with coastal themed artworks. Mick also lives in Craster so his work is authentically local and he is one of the most well-known artists in Northumberland. Click here to visit his website. There is ample parking at Craster, just before you reach the harbour there is a large car park on your right, behind the Tourist Information Centre. There are public toilets here. The car park continues to an overflow into a former quarry site, though it can still get full very quickly at the weekends and in the summer months. Please be very careful when parking here, there are signs saying you must park within a bay or you will receive a fine. We would always encourage visitors to travel by public transport whenever possible, up to date information is provided by the Northumberland Coast AONB here. Craster is named after the Craster family who had held the estate since 1272. Walking into the village from the car park or bus stop you’re greeted with a lovely view of the harbour. The harbour was built to commemorate the death of a member of the Craster family who died while serving in the army in Tibet in 1904. The memorial is still visible on the harbour wall, as are the remains of a much taller structure at the end of the harbour that was used to lift stone from the nearby quarry (now the car park) on to the boats in the harbour. The stone from the quarry, which was shut down in 1939, was shipped to London where it was used for kerb stones, it is now a nature reserve under the protection of the Northumberland Wildlife Trust. Nearby is Craster Tower, an 18th century mansion incorporating a mid 14th century Pele Tower which belonged to the Craster family. The property was enlarged in 1666 when a two-story manor house was built on to the east side of the tower. Most of the estate was sold by Sir John Craster in 1965 and the tower is now residential apartments. Perhaps the main reason most people visit Craster, apart from to enjoy its natural beauty as an authentic Northumbrian fishing village, is to visit Dunstanburgh Castle. The Castle is most easily accessible from Craster, but it is still a walk of about a mile along the stunningly beautiful coast. Carrying on beyond the castle will take you to the historic seaside hamlet of Newton-by-the-Sea with its quaint little pub, famous for its delicious crab sandwiches and own beers, brewed at its on-site micro-brewery. The village itself has many circular walks, Robson’s Smokehouse (world famous for their kippers), the Mick Oxley Gallery, fishing trips from the harbour and fine golfing in the area. Click here to read about more to do in Craster. We know the area and all of our cottages inside out, so if you have any particular queries, please don’t hesitate to call or email us. We’re more than happy to help! Telephone: 01665 710 700 or click here to email us your enquiry. Stay in touch and keep up-to-date with all our latest news and exclusive cottage offers. You can do this by joining us on social media. Registered Office: Coquet Cottages Ltd, 2 Station Road, Warkworth, Northumberland, NE65 0XP. Company No. 10906004. VAT No. 278 4314 80. Coquet Cottages and the Coquet Cottages logo are registered trademarks of Coquet Cottages Ltd. All content © Copyright 2018 Coquet Cottages Ltd and protected under UK and International law. Duplication, reproduction and/or distribution of any material on this website is strictly prohibited. All rights reserved.